Revamp your bangle collection with this alluring Zircon stone studded Floral Bracelet Bangles. Wrist shape oval bangle is openable with single clip on one side and the pearl bead at the center of the floral design gives a trendy and traditional look. Gorgeous antique fashion necklace with a row of delightfully carved Leaf motifs along with three layer ball chains. A perfect classic necklace paired with simple Leaf design ear studs. Apt for casual and daily wear. This gold plated bangles have Five waved circles and Red Stones studded in between each layers. Ideal for Casual & Formal outings. Designer round net chain with Red stone Pendant and matching Ear Studs. It is best suited for Teenagers and ladies for Parties, Weddings and Engagement functions. 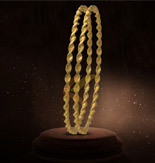 This Gold plated Chain have a attached white stone fixed pendant which have a traditional Knot on centre, which is called "Pavithrakkett" in Kerala; which means "Sacred knot". Further detailed with Heart designs on each strand end, this simple gold plated ethnic necklace perfectly accentuates a natural neckline shape on any occasions. 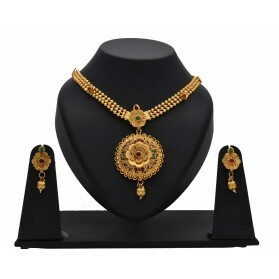 This Gold plated Chain have a attached round floral Pendant which have further detailed with round designs on each strand end, this simple gold plated necklace perfectly accentuates a natural neckline shape on any occasions. A modern Design two tone Diamond cut Rhinestone fixed pendant set with a two tone chain. A great choice that will match any outfit and make you look elegant. This simple elegant American Diamond Necklace set speaks for itself. These amazing Necklace have a small Ruby teardrop-shaped construction at center and matching ear drops. Dazzle up your festive wear with this spectacular gold plated necklace set. 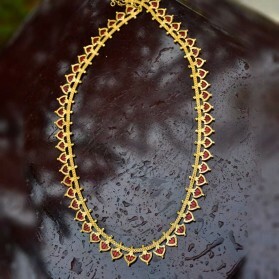 This simple gold plated Enamel Red Stone Necklace is a best option for your daily office or college wear. One can pair it with their Indian or western attires for look simple. This Stylish Necklace designed with creativity is adorned with American Diamond Stones. It has matching Ear drops. The elegant designs of the Necklace with tear drop dangle will attract every one attention. A beautiful and stylish gift for your loved ones on auspicious occasions. 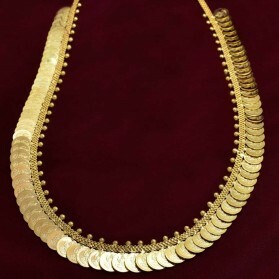 Ethnic Filigree designed Chocker with matching ear hangings. 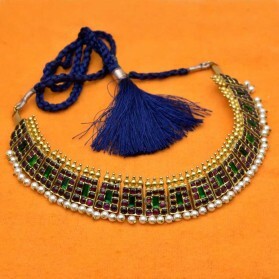 This classic necklace is perfect for Marriage functions with ethnic wear. 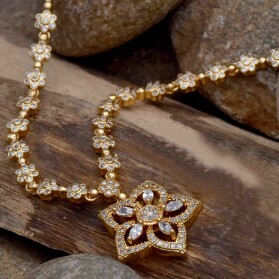 One Gram Gold adorable Lakshmi net Pendant is very traditional South Indian, Kerala Jewellery. Goddess Lakshmi engraved on a intricated designed pendant. It will give an ethnic touch to your beauty on festive occasions and Marriages with traditional long chains. Adorable one gram gold Shri Krishna Pendant is very traditional South Indian, Kerala Jewellery. Lord Murali Krishna is engraved in an intricate designed net pendant. It will give an ethnic touch to your beauty on festive occasions and Marriages with traditional long chains. Adorable one gram gold Lord Ganesha Pendant is very traditional South Indian, Kerala Jewellery. Lord Ganesha placed on the center of the big round pendant and encircled with intricate net designs. This classic jewelry will give an ethnic touch to your beauty on festive occasions and Marriages with traditional long chains. Micro Gold Plated double layer Jasmine choker type Necklace with adjustable link chain is usually worn on Marriages and engagements with Sarees and ethnic dress and to temple or Festive occasions. Alluring one gram gold necklace set is finely studded with American diamond Stones and pearl hanging. You will feel like a beautiful princess whenever you wear this delicately crafted neck piece. It has cute Paisley motifs which will make you feel feminine and graceful. Wear it with Indian formal attire on special occasions and Marriage functions. Elegant triple layer antique designer Kemp necklace with matching jumkas. This classic neck piece is elegant to wear. Length adjustable with thread. It is well suited with Sarees and any ethnic wear on marriages or traditional occasions.